The City of Winter Park issued the following news release on Friday announcing that construction will begin on the section between Orange and Fairbanks avenues. For more details, contact the City of Winter Park Public Works Department. WINTER PARK, Fla., an internationally recognized ICMA Excellence Award winner with accredited fire-rescue, police and parks & recreation agencies (October 6, 2017) – On Monday, October 9, Phase 1 of the Denning Drive Multi-use Trail Project begins between Orange and Fairbanks avenues. During Phase 1, Denning Drive will be reduced to two lanes, one for each direction of travel. Phase 1 construction is expected to take 6-8 weeks with an expected completion of all three phases by the summer of 2018. 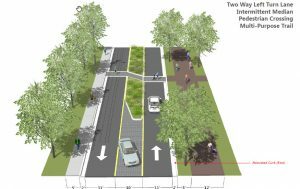 The Denning Drive Multi-use Trail Project was approved by the Community Redevelopment Agency (CRA) in February 2017. As part of CRA’s 5-Year Capital Improvement Plan, Denning Drive was one of the first projects the CRA evaluated under the city’s Complete Streets Resolution for performance, needs and possible improvements. This project is designed to improve the experience of walkers, bikers, bus riders, and cars without compromising the function and level of service of the road. Upon completion, Denning Drive will have a 10-foot wide multi-use trail on the east side from Mead Botanical Garden to Webster Avenue. This trail will connect all neighborhoods along Denning Drive, Orlando Urban Trail, Orange Avenue Commercial District, Martin Luther King, Jr. Park, the new library & events center, Morse Boulevard, Winter Park Train Station, Valencia College, the Winter Park Village commercial area, Winter Park Tech, Whole Foods® shopping plaza, and a future connection to the Ravaudage development, City of Maitland and Town of Eatonville. In addition to the trail, the signalized intersections will include left turn lanes. There will also be medians in the center lane where left turns are not needed with enhanced midblock pedestrian crossings, trees and landscaping. The city continually strives to minimize inconvenience to local residents and through traffic during construction. Please obey the construction signs and use caution when driving in this area. For additional information, please contact the Public Works Department at 407-599-3411.